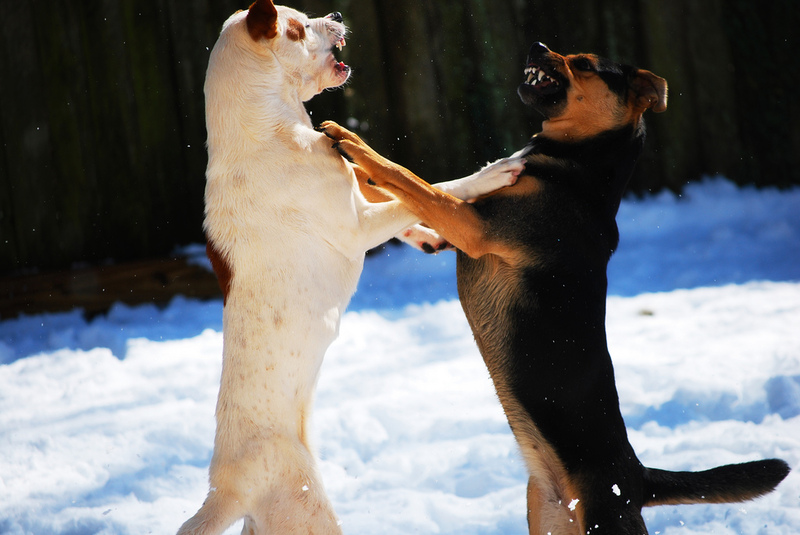 Trying to separate fighting dogs can be dangerous for both you and the dogs if you don’t have a plan. My husband and I take our young Boxer, Banjo, to the dog park a few times a week. Banjo has made lots of friends there. She gets to play fetch, wrestle and run across a big field of grass. We’ve had nothing but wonderful experiences with the other dogs during our puppy’s social visits — that is, until recently. When a massive Bulldog mix appeared out of nowhere one morning and pounced on a shih tzu, my brain froze. Almost 10 years of experience in handling dogs vanished, and I reacted without thinking — putting myself in danger. Is It Fighting or Just Playing? Are you getting ready to break up a fight or just an especially vocal pair of playful dogs? Before rushing in to the rescue, make sure your intervention is truly necessary. Remember that your safety is most important before breaking up a dog fight. If you’re ever in the terrible position of having to break up a dog fight, the safest methods are always hands-free, keeping your own safety a top concern. It’s difficult to restrain yourself from reaching into the middle of a brawl and separating the dogs. But even your own dog may not recognize you when she’s in the midst of a fight and could bite you inadvertently. 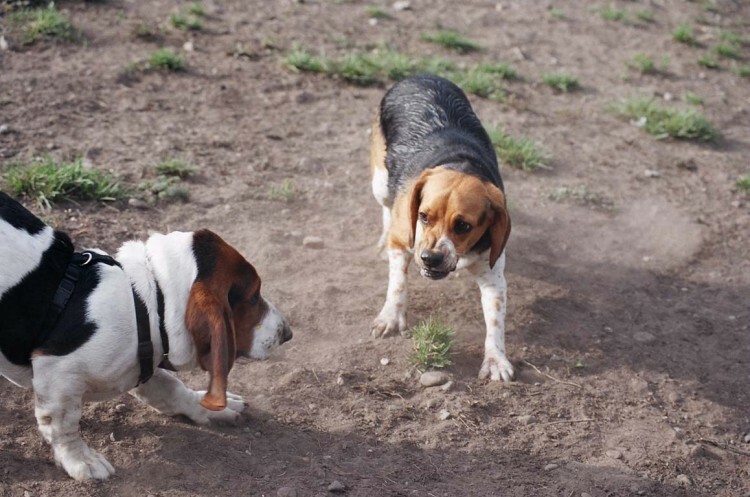 Back to my time at the dog park — the Bulldog began violently shaking the shih tzu. The little lapdog started screaming, and my husband and I both made the mistake of reaching for the Bulldog to pull him away. We could have been bitten easily. We weren’t even familiar people to him. Screaming and clapping. Noise might startle them and stop the fighting. Dousing them with water. The sudden shock can break up a fight. Hoses work best, but even a bottle of soda could work. If you have no luck separating the dogs using the hands-free methods, you may have to physically get involved. Use extreme caution. Never reach for the dogs’ necks or faces. Grab them only from behind, as they may be startled and turn to bite. Grab a dog’s hind legs. Once you have both, back away and continue to move backward until the dogs are separated and you can redirect your dog. Breaking line of sight is important. Leash your dog. If you’re the only one breaking up the fight, try to leash one and tie him to a fence so that you can drag the second dog away, like a wheelbarrow (see above). Don’t assess your dog’s injuries until he is safely out of the other dog’s range and has calmed some. Keep in mind that dog fights almost always sound more violent than they actually are. It may not seem that you have time to rationalize your moves and stay calm, but you probably do. Rather than risking personal injury, stay level-headed and make the right decisions. Right when my husband and I were certain the shih tzu was doomed and we’d never be able to pull the Bulldog off, a third pair of hands appeared and lifted the massive white dog from the shih tzu. He was the Bulldog’s handler. After ensuring he had a secure hold on his dog (who was still lunging wildly), we checked on the shih tzu. His human was cradling the tiny, trembling dog in his arms. The shih tzu had some scratches, a couple of puncture wounds and a little blood, but seemed otherwise OK. It wasn’t until we’d left the park that I realized we’d put ourselves in danger because we reacted without a plan. If we’d followed some of the safer techniques mentioned above, we may have successfully broken up the fight earlier and without endangering our well-being. Let’s hope there will never be a “next time” — but if there is, I know I’ll be better prepared to help.